More than any of the other traits that define him — complex plots, conflicted heroes, subverted realities — Christopher Nolan specializes in world-building. Take Interstellar, his new, $165 million movie: From minute one, we’re in another place, not only geographically but also politically, aesthetically, and culturally. This has been Nolan’s M.O. for some time now. As one of the few filmmakers with the unique combination of ingenuity, budget, and studio mandate to create universes from whole cloth, his work, dating back to The Prestige, has been an exercise in making films that exist in their own unique languages. Whether you like his movies or not, you can’t deny that Nolan goes as far as any of our other filmmakers toward making his wildest ideas physical. But while most of the focus on this world-building centers on the engine, the grand conceit that makes his movies go, be it “dreams are places humans can visit” or “deep space travel is possible,” there’s another part to it: the people involved. When you get beyond the movie stars who tend to embody his (male) leads — the Bales, the McConaugheys, the DiCaprios — you find deep, nuanced ensembles filled with surprising choices. There are the Heath Ledgers and the Tom Hardys, for sure — actors whose potential Nolan sees before most. But it isn’t just before the fact that Nolan spots potential. It’s also after. Call it the Chris Nolan School for Fallen Stars. In all of his blockbuster films — The Prestige, the Batman trilogy, Inception, and now Interstellar — Nolan has shown a taste for (male) actors who were once leading men and now have about as much place in Hollywood as a projectionist. He will go out of his way to cast actors like this in his movies, even if their parts are insignificant or fleeting. He fills the worlds of his film with men he thinks have gravity. Batman Begins got the ball rolling. Its cast is sprawling and eccentric, highlighted by name-brand (male) actors like Liam Neeson, Ken Watanabe, Tom Wilkinson, Gary Oldman, Michael Caine, Morgan Freeman, and Christian Bale. Beyond the recognizable names, though, Nolan finds room for Rutger Hauer to play Earle, the CEO of Wayne Enterprises. Hauer’s heyday came in the ’80s, like many of the former leading men who Nolan turns into character actors; most notably, Hauer played Roy Batty in Blade Runner, where his aerodynamic face and pigment-less hair made him a very believable replicant. Even though Hauer kept working furiously between the ’80s and Batman Begins, and has worked furiously since — his IMDb page is longer than a cruise-ship manifest — none of his roles had been even close to Blade Runner–caliber, even if Sin City did give him a fleshy part to work with. 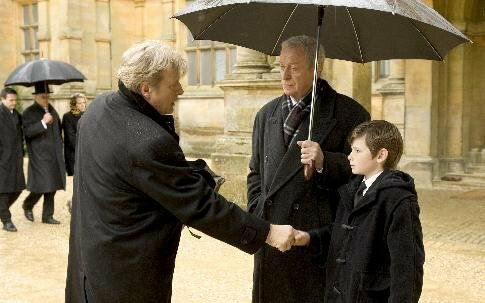 But in Batman Begins, Nolan uses Hauer’s natural menace and authority to great extent. The casting is as effective as it is surprising. Then there’s David Bowie, walked out of the lightning storm. Well into The Prestige, Nolan’s best film, Hugh Jackman’s desperate magician Robert Angier has chased a lead into the mountains of Colorado, looking to meet Nikola Tesla. Tesla was a brilliant scientist and inventor, weird enough to have provoked the kind of fascination and curiosity that still exists 70 years after his death. Nolan uses Tesla’s rivalry with Thomas Edison as a historical analogue for the competition between Angier and Bale’s Alfred Borden. Nolan understands that the rush of unveiling Tesla to the audience will be considerable, and he also understands that any effect Tesla has will be multiplied tenfold by putting Bowie, one of pop culture’s greatest weirdos, in the role. It’s layering. Like the dreams he’ll later play with in Inception, Nolan making Bowie a fictional Tesla, based on a real Tesla, forces us to parse where our understanding of each ends and begins. It helps that Bowie portrays Tesla as some cross between Count Dracula and a monk. The rest of the casting in The Prestige is fairly straightforward; for a complex and multi-continental, 130-minute Nolan movie, there are few characters of any real consequence. Bale and Jackman’s polarity give the movie all the fuel it really needs. Nolan would return to true ensembles in The Dark Knight, and dip back into the ’80s leading-man well — remember: Bowie was also a leading man in the ’70s and ’80s! — by dredging up Eric Roberts. Fun fact: According to IMDb, Eric Roberts has approximately 9,000 movies in postproduction right now. Oscar-nominated in 1986 for Runaway Train, Roberts, the brother of Julia, was a classic heartthrob whose career had fallen into absurdity, with a mixture of sitcom and CSI roles and movies like this. Nolan cast Roberts as Sal Maroni in The Dark Knight, the mob boss who hires the Joker to kill Batman. Roberts’s otherworldliness, well-honed from growing up in and coming to embody Hollywood excess, gives Maroni an essential arrogance. You couldn’t just cast anyone opposite Ledger’s Joker, just like you can’t put anyone in front of a bull — you need somebody crazy, or unaware, enough to play at that level of unhinged. In his next two movies, Nolan would try a slight variation: He’d dip into the war chest. 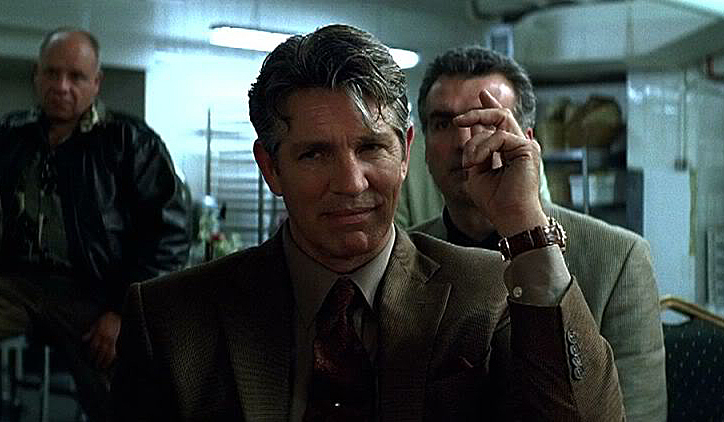 In Inception, Nolan cast Tom Berenger as Browning, the godfather and adviser of main mark Robert Fischer. 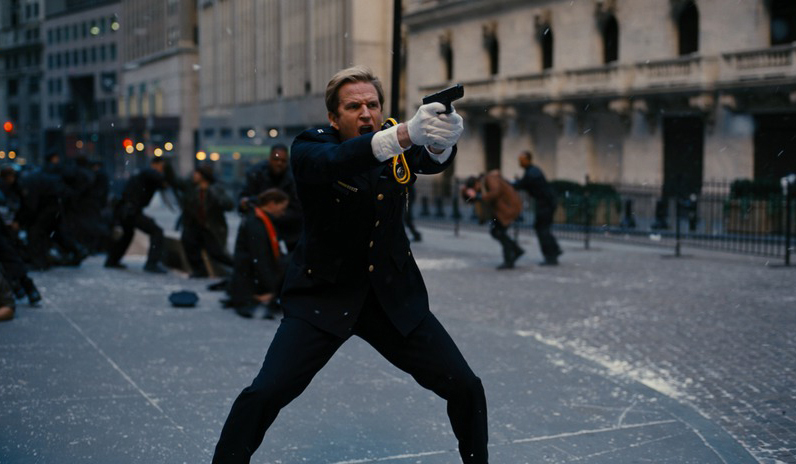 In The Dark Knight Rises, he uses Matthew Modine as Deputy Commissioner Peter Foley, who takes over for a hospitalized James Gordon. Both men are most famous for their roles in two of the better war films ever made: Berenger was nominated for an Oscar for his part in Oliver Stone’s Platoon, and Modine played Private Joker in Stanley Kubrick’s Full Metal Jacket. Neither was anything near high-profile by the late 2000s, and their parts in these films capitalize on the authority both men have as actors, along with a certain sense of corruption. Berenger and Modine’s characters have a similar effect — it isn’t necessarily that they are deceitful, but the possibility of deceit, the capacity for it, is essential to each man. 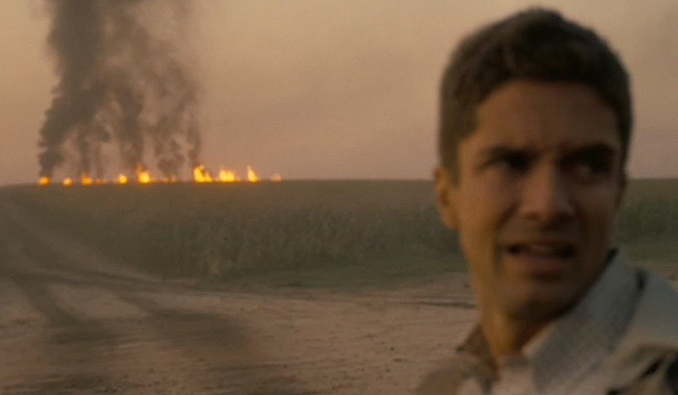 It isn’t likely that Nolan thought, Hey, what slumbering actors from great war movies can I grab? But there’s something appealing about the idea that he sat down one day for a Vietnam film festival and came out with Berenger and Modine. Aside from one scene from William Devane, best known for playing Janeway in the classic thriller Marathon Man, Interstellar doesn’t have any casting quite so archaeological as Hauer, Bowie, Roberts, Berenger, and Modine, though it is not without its finds. Topher Grace, Wes Bentley, and John Lithgow are actors who, while not forgotten, aren’t exactly crucial to the creation of many 2014 blockbusters. Lithgow’s still-thriving career focuses more on intimate indies like Love Is Strange, for which there’s been talk of an Oscar nom, though he did get some shine in Rise of the Planet of the Apes. Grace is in the midst of a reinvention that seems to be orienting him toward self-aware comedy and stylish entertainment like the forthcoming American Ultra. Lithgow ends up bringing this sweetness to his role as Coop’s father-in-law and the caretaker grandpa of Murph and Tom, Coop’s children. To play one of his two non-Hathaway/McConaughey astronauts, Nolan dredged up Wes Bentley, the former sensitive-teen star of American Beauty. Aside from an appearance in the first Hunger Games, Bentley’s career has been marked by the kind of roles that cause a part in Ghost Rider to be a peak, but now he’s cruising — he snagged an IMDb credit for Terrence Malick’s Knight of Cups, though with Malick, this could mean anything from two hours of screen time to days work left on the cutting-room floor. Grace, meanwhile, has the misfortune of playing a complete blank space of a character. Even when his work doesn’t hit the mark, Nolan uses these actors like building blocks for an ecology of his own imagining. Dormant (male) actors, take heart. If Nolan needs you, he’ll find you.